The MV Dive Race Thailand liveaboard is 35 meters (115ft) in length with a seven meter (24ft) beam. Dive Race is an ocean going vessel built with strength, stability and comfort in mind and takes a maximum of 28 guests in 10 cabins. Dive Race liveaboard uses marine air conditioning units, not household units like other vessels. Nitrox is available on board. Dive Race liveaboard’s scuba diving destinations include the Similan Islands, Koh Bon, Koh Tachai and Richelieu Rock. She offers the southern islands itineraries of Phi Phi, Koh Ha, Hin Daeng and Hin Muang as well. She carries safety equipment for safe passage at sea including first aid kits, Oxygen, a DAN oxygen kit, two 25-person SOLAS life rafts, and SOLAS life jackets for both adults and children. Her communication gear includes VHF radios, SSB radios for long distance communication, CB radios, a GPS, radar, echo sounder, satellite and mobile telephones. She carries 28,000 liters of water, and environmentally responsible black water tanks. Diving takes place from two 4.2 meter RIB dinghies. She has a dedicated massage room for your aches and pains. Her large interior saloon features a 60″ TV to watch your own videos or photographs taken during your dives. The MV Dive Race Liveaboard has six cabins with double or twin futon-style beds and four cabins with twin bunk beds holding two or four guests. 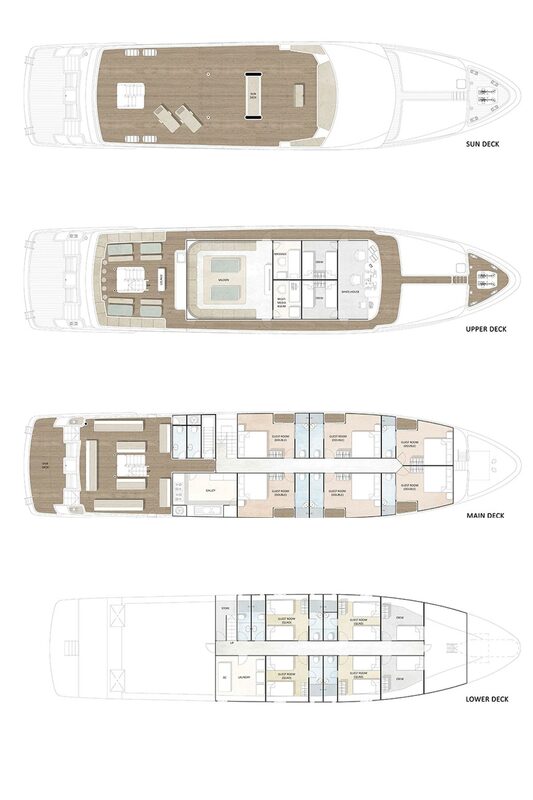 She has a total of 12 bathrooms on board complete with hot and cold showers. Her deluxe cabins can be configured for both single and couples. Dive Race operates in Thailand. Most of her trips are five days in length though she is able to stay at sea for weeks at a time. She is available for individual bookings as well as charter cruises. Individual prices are listed below in the schedules. Please contact us for charter prices. She takes scuba divers to Similan Islands, Koh Bon, Koh Tachai and Richelieu Rock. All Thailand departures are from Thap Lamu, Thailand, serviced by Phuket International Airport (HKT). Transfers are provided from your hotel or the airport to the vessel.